We are asking Alibaba Group’s Jack Ma onstage to talk more about his efforts to make the company a powerhouse in China and elsewhere. 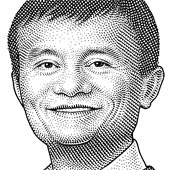 His recent bare-knuckled fight with Yahoo over Alipay, as he has built a wide-ranging Internet giant, should make for an interesting interview. Where Are Those 40 Thieves When You Need Them? The blog let loose the flood of memories. Told sometimes that I should write my memoirs, I failed to see how I possibly could. I had memories, I had lived a good life in an interesting time, but I was at a loss to see how I could organize the accumulation of a lifetime. It was the blog that taught me how.